The Hawks fought back from 12 down, showing a tremendous amount of guts in a 103-100 win over the Celtics in front of 20,425 screaming fans at Philips Arena on Friday ... The win forced a seventh and deciding game in the series (Sunday, 1 p.m., ABC, 790 The Zone). Marvin Williams led a balanced scoring attack with 18 points, while Mike Bibby added 17, Al Horford had 16, Joe Johnson and Josh Childress tallied 15 each, and Josh Smith finished with 11. Williams left the game in the third quarter with a sprained left knee, but returned late in the contest. The Hawks fell behind early, trailing 32-20, after one ... But Atlanta rallied behind a 29-18 second quarter to pull within one (50-49) at the half ... Following the pattern of games 3 and 4, Boston surged ahead in the third, pushing the lead back to nine ... But again the Hawks made a move, cutting the deficit to three (82-79) through three ... Early in the fourth, the Hawks too the lead, riding a 10-0 run midway through the fourth to take a 96-89 lead ... Boston eventually cut the lead down to 2, but the Hawks hung on. 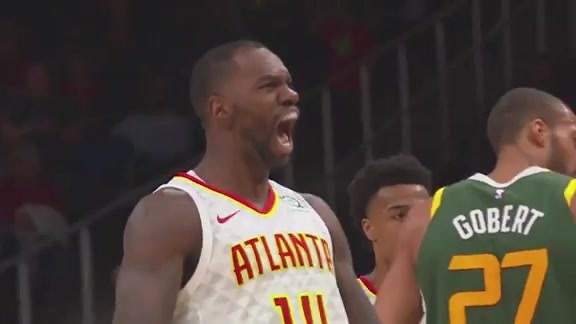 Atlanta got their best bench contribution of the series, totalling 26 points and 13 rebounds from the reserves, including 15 and 6 boards for Childress, and 9 pts, 6 rebs and an emotional lift from Zaza "Balboa" Pachulia. Tonight's attendance (20,425) was the most ever for a Hawks game at Philips Arena, and 2nd in the arena's history to the 20,596 drawn for a U2 concert on 3/30/01. he can't go, Josh Childress needs to play as big as his afro. every possession was so crucial to both teams? the end, so hopefully he will be good to go for Sunday. Way to go Marv! by the Hawks bench all around in general. nothing went wrong tonight that 103-100 doesn't make up for.